Enveloped, spherical to pleomorphic in shape, 80-100 nm in diameter. Mature capsid contains 1572 capsid proteins. Monopartite, linear, dimeric, ssRNA(+) genome of 9,75 kb, with a 5'-cap and a 3’poly-A tail. There are two long terminal repeats (LTRs) of about 600nt long at the 5' and 3' ends. The LTRs contain the U3, R, and U5 regions. There are also a primer binding site (PBS) at the 5’end and a polypurine tract (PPT) at the 3’end. 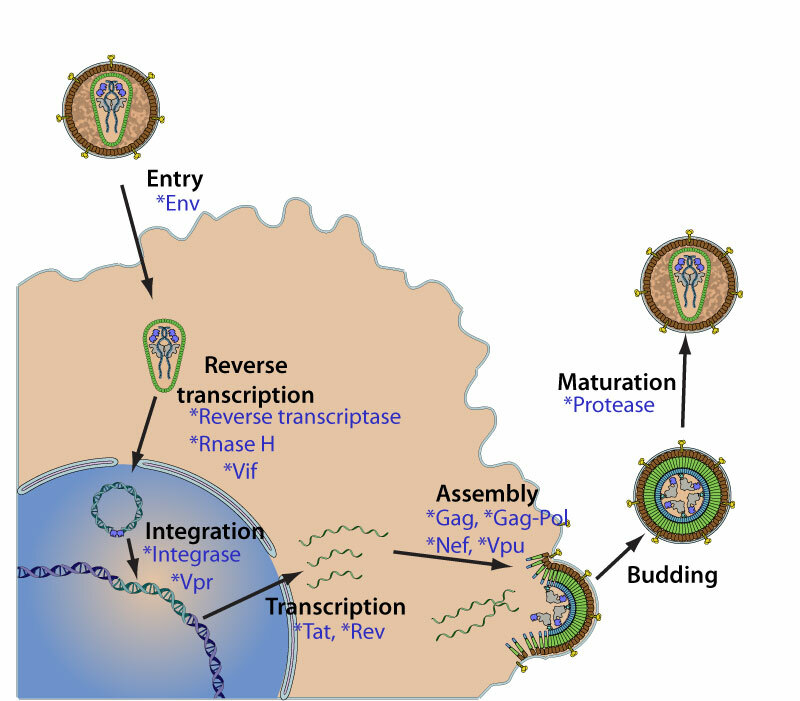 The integrated provirus utilizes the promotor elements in the 5' LTR to drive transcription. This gives rise to the unspliced full length mRNA that will serve as genomic RNA to be packaged into virions or used as a template for translation of gag and gag-(pro)pol (1 ribosomal frameshift) polyproteins. The uncompletely spliced mRNAs encode env that is cleaved into SU and TM envelope proteins, and the accessory proteins vif, vpu, and vpr. Completely spliced mRNAs encode Rev, Tat and Nef accessory proteins. Rev escorts unspliced and uncompletely spliced RNAs out of the nucleus of infected cells. Virus attaches to host CD4 receptors through the SU glycoprotein (gp120), with subsequent interaction with a chemokine coreceptor. Internalization via clathrin-dependent endocytosis. TM glycoprotein (gp41) mediates dynamin-dependent fusion with the host endosomal membrane. Nucleocapsid is released into the cytoplasm, with partial uncoating. 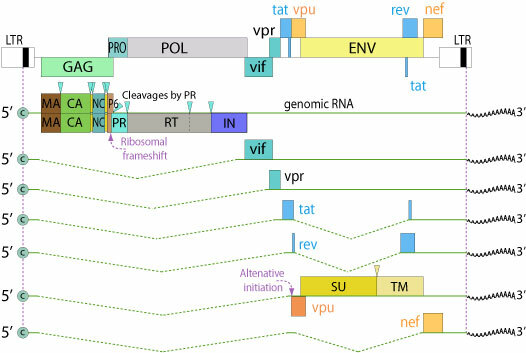 Translation of spliced viral RNAs produces tat, rev, and nef proteins. Rev mediates nuclear export of the uncompletely spliced RNAs. CELL TROPISM CD4+ T cells, macrophages and dendritic cells. ANTIVIRAL DRUGS Protease inhibitors (PIs): amprenavir, atazanavir, indinavir, loprinavir, nelfinavir, ritonavir and saquinavir. Reverse transcriptase nucleoside inhibitors (NRTIs): abacavir, adefovir (PMEA), didanosine (ddI), lamivudine (3TC), stavudine (d4T), tenofovir (PMPA), zalcitabine (ddC), and zidovudine (AZT). Reverse transcriptase non nucleoside inhibitors (NNRTIs): atevirdine (BHAP U-87201E), delavirdine, efavirenz (DMP-266), emivirine (I-EBU), and nevirapine (BI-RG-587). EXPERIMENTAL CLONE PNL4.3 pNL4-3 is a subtype B strain that is normally used as the reference sequence for HIV drug resistance studies. It is a recombinant (infectious) proviral clone that contains DNA from HIV isolates NY5 (5' half) and BRU (3' half). The site of recombination is the EcoRI site at positions 5743-5748. 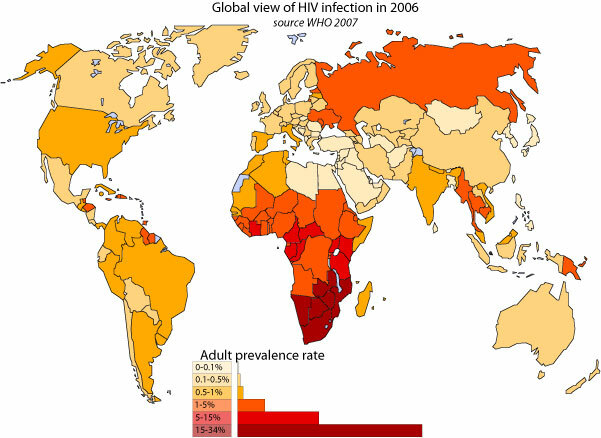 HIV-1 group M is responsible for the worlwide pandemy of AIDS. It is subdivised into 9 subtypes (A-F), and several CRF. HIV viruses are subdivised into groups, subtypes and CRF. Groups N and O are recent and so far restricted to cameroon. 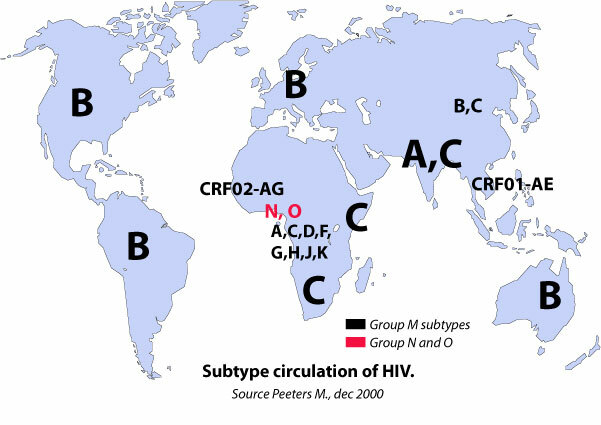 The vast majority of HIV-1 strains found worldwide belongs to Group M (Major). This group is subdivised into 9 subtypes (A-F), and several CRF (circulating recombinant form).